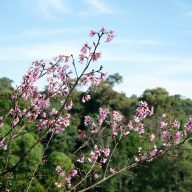 I had been planning to visit Doi Inthanon for a long time, but because the trip required some planning and preparation, I was always putting it off for another time. There was no excuses this time. Chris wanted an adventure, the weather was almost perfect and the time to leave Thailand was approaching, so we simply had to do it. 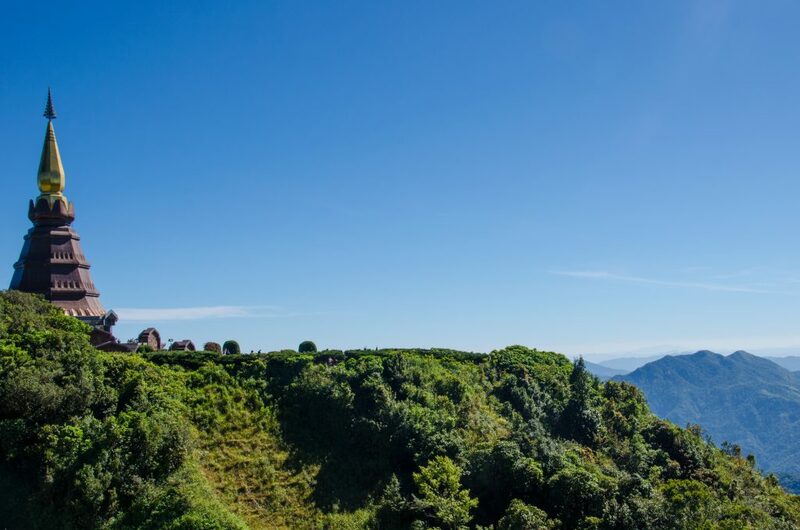 Doi Inthanon is the highest peak in Thailand. 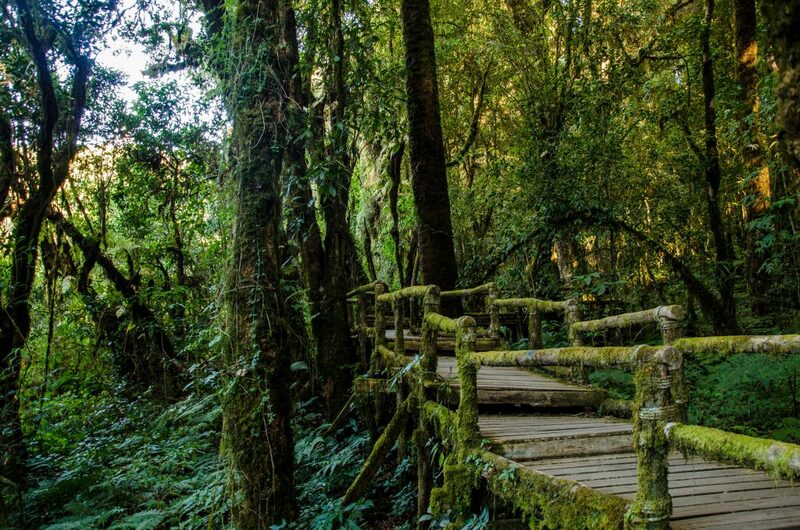 It is located in Chom Thong district, Chiang Mai province, in the Doi Inthanon National Park. The area is covered with lush green forest, waterfalls and the drive up the mountain rewards you with amazing views. 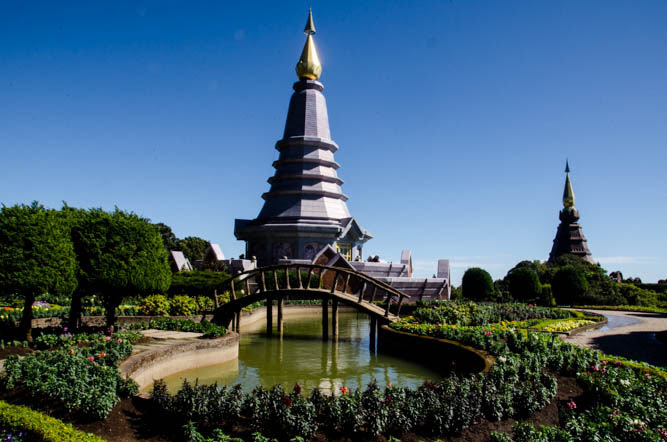 The main attractions of the Park are two temples built on the peak of Doi Inthanon, surrounded by beautiful gardens and even more amazing panoramas. The main pagoda in the Doi Inthanon National Park. We decided to stay in Doi Inthanon only for one night, so left early on a Saturday morning. It was 8 am. Chiang Mai was still sleeping. The temperature seemed to be ok. December is a cold month in the north of Thailand. We had heard rumours that it was 3 degrees up there and took all our warm clothes with us. I don’t know what the temperature was exactly in Chiang Mai back then, but on the bike it seemed like we were in Alaska. After a bit I had to stop to put my puff jacket on, wrap my head in a scarf and finally use my wool gloves. It was freezing! The road at the beginning wasn’t interesting. We drove on an express way for a long time, passing a couple of rice fields, still covered with a morning mist and a few temples, but most of the time it was pretty boring. We stopped only once for a warm coffee and to get gas. We arrived at our accommodation at around 10 am. Only then it was beginning to get a little warmer. We had booked a bungalow for 3 (our friend Cel was joining us) for only 750 Baht. Baansuan Home turned out to be a great choice. The bungalows were clean, there was air-con, fan and a hot shower. The room came with complimentary coffee and drinking water. Even the beds were comfortable enough. The owner was absolutely lovely. She didn’t speak much English, but she really tried to make our stay pleasant. After a bit we decided to drive up the mountain. Baansuan Inthanon Resort was only about 10-15 minutes drive from the main entrance to the National Park. As soon as we started driving the temperature was dropping down again, and again we had to stop to put some warmer clothes on. The entrance fee was 300 Baht – a bit excessive if you ask me, but this is Thailand and foreigners pay five times more what a Thai person does. We didn’t have much information about what to do in the park, except from a few blogs here and there. There were also no brochures available for tourists. The maps on our phones weren’t the best and didn’t really show any points of interest in the area, so we just started driving up the mountain and decided to stop whenever we saw something that would interest us. The first was the Wachirathan Waterfall, which Chris and I had visited once before with our Thai friends. It was rainy and cold back then and this time we had a beautiful sunny weather with cloudless blue sky. It took us a while to take photos from every angle and to squeeze through the crowds of Asian tourists, but staying there for a bit and listening to the water, observing small rainbows appearing every now and then, where the water hit the ground, was well worth it. Wachiratan Waterfall is one of the most impressive waterfalls in the Park. After that we stopped at the Mae Klang Waterfall. This one was much smaller and not as impressive, but it was surrounded by beautiful trees and it looked pretty with the sun cascading on the flowing water. The road wasn’t as bad as I thought it would. There were quite a few curves and it was steep, but my small Honda Click, which was probably made for driving in the city only, did a good job there. The drive to the very top wasn’t that long. After stopping once for drinks and a toilet break, in the middle of the route, it took us another 20-30 minutes to get to the temples. We had to leave our bikes outside of heavily guarded gate, pay another 40 Baht and take a complimentary ride up a small hill, which would have been easy to walk, but I guess the guards must have had a valid reason to charge another entrance fee. One of the stupas seen from the bottom of the hill on which it stands. 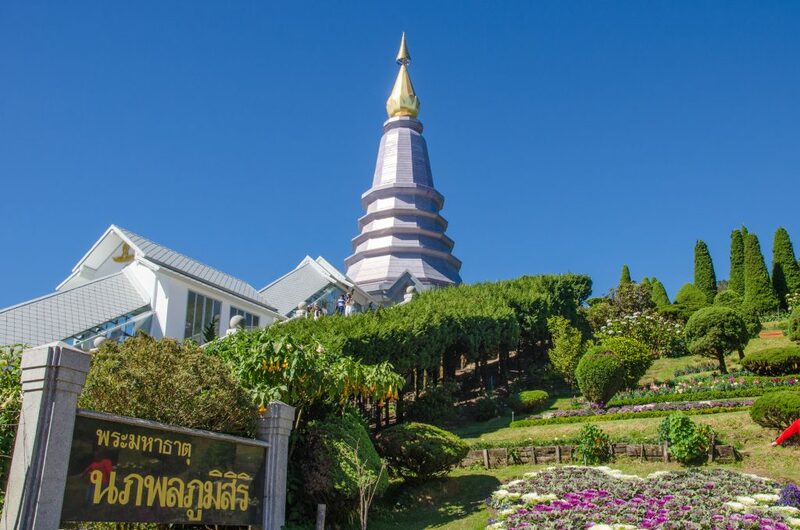 The temples on Doi Inthanon were built to commemorate the fifth cycle birthdays of King Bhumibol Adulyadej and Queen Sirikit. They sit on opposite peaks, facing each other and share the same design and colour. 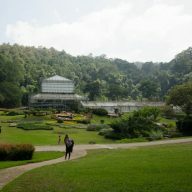 They are surrounded by picturesque gardens and views that are probably the most breathtaking in the whole of Thailand. We spent a long time walking around them, admiring the architecture, the flowers, the panorama and breathing in the fresh, cool air. The next thing I really wanted to see was the Ang Ka Luang Nature Trail. I had seen pictures of it and couldn’t wait to see the moss covered creepy forest. The trail is 360 meters long, and because we didn’t have that much time, it was a perfect little trek. 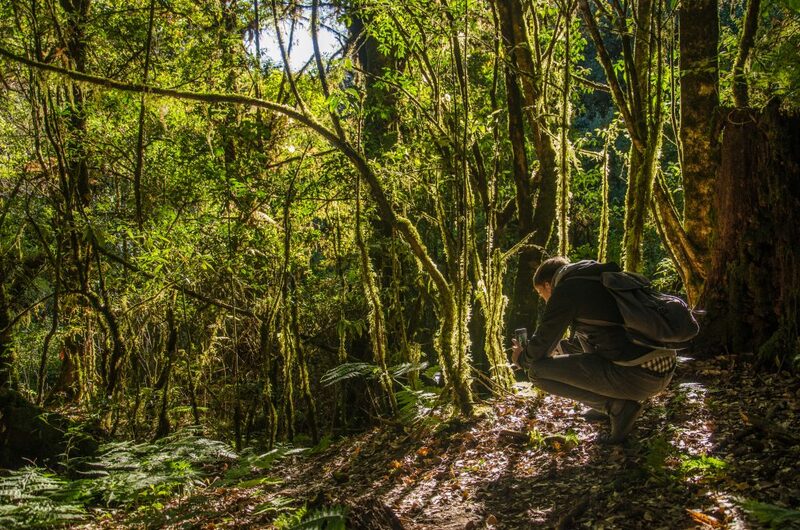 Ang Ka Luang is one of just a few treks visitors can do in Doi Inthanon. The other well known one is the Kiu Mae Pan, which can only be done with a guide. The Ang Ka Luang Nature Trial is located a little further up the mountain, on the right hand side. There is a big sign pointing at it. Opposite the entrance is the Summit Coffee – a little coffee place that sells one of the best coffees I have ever had in Thailand. Who would have thought I would find a delicious coffee here. The trail itself was nice. Unfortunately, the moss died out as it only thrives during the rainy season. However, the forest was still worth visiting. I really liked the density of the trees and the light that was coming through. As it was getting darker, we decided to go back. On the way we stopped at km 31, where we bought some deep fried bananas, lychee vodka and sweet cocktail tomatoes at the Hmong market. By the time we got home it was dark. 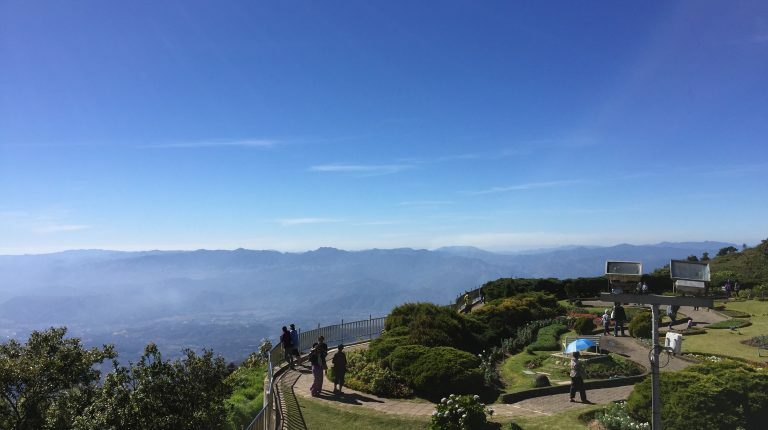 Doi Inthanon is huge and there are lot of other things you can do. It is really worth going for more than just one night to explore the area more. Plan at least 2-3 full days. Below you will find more information about the park. 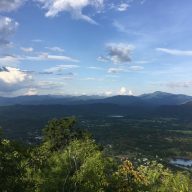 Travel 58 kilometres west of Chiang Mai via Highway No. 107 to Chom Thong, then turn right into Highway No. 1009 and continue a further distance of 48 kilometres along Highway No. 1009 to the summit. The road is not too difficult, but your vehicle should be in a good condition. You can take a song teaw from Phra That Chom Thong or Mae Klang Waterfall. It runs to Doi Inthanon and local villages. The fare is 20 Baht. A chartered Song Thaeo costing around 800 baht can make stops at other attractions around the area. It is also possible to go on a tour from Chiang Mai. Every tourist office in the city has one in their offer. The cost is around 2000 Baht each. 300 Baht for an adult, 200 Baht for a child, plus 20 Baht for a scooter. An additional charge of 40 Baht needs to be paid to see the pagodas. I think the best time to go is during the winter (from end of November to end of January, middle of February). Hot season could be pleasant as it is much cooler up there, but it is also the season when the farmers burn out the fields and the views will probably be obstructed by the smog. Remember that during the winter it is really cold there. There are plenty of accommodation options around the park. I also know a couple of people, who took hammocks with them and just camped in the forest. While this might be fun to do during the hot season, I wouldn’t recommend it for winter and rainy season. Baansuan, where I stayed, is a really great option. The lady doesn’t speak much English, but she is very nice and you will really feel welcome there. Warm Clothes: If you drive a motorbike, take a puff jacket and gloves. If you are going on a tour, then a light jumper and long trousers should be fine. Food and drinks: There is no need to take much with you. A bottle of water is always a good idea, but most of the things you can find either at the market (km 31), or at small shops scattered along the way. There is also a restaurant mid-way, where you can have some nice Thai food. Cash: Take cash with you. There are no ATMs in the park. Gas: It is quite hard to get petrol in Doi Inthanon. Around km 30 there is a small village, where they sell gas, but other than that there is no other place. If you are afraid of running out, then buy a bottle or two in the town before the entrance of Doi Inthanon. 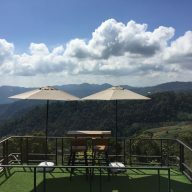 What to do in Doi Inthanon? 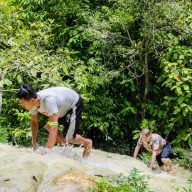 Waterfalls: Mae Ya (14 km from Chom Tong, before the gate to the National Park), Wachiratan, Mae Klang – you can visit them in that order. Mae Ya is located on a slightly different route. At km. 57 (2 kilometer before arrive to Chomthong district) take a right on route 1009 (Chomthong-Doi Inthanon Road). May Ya Waterfall is located 1 kilometer from highway no. 1009 junction, turn left for 14 kilometers and then take a 200 meter walk. 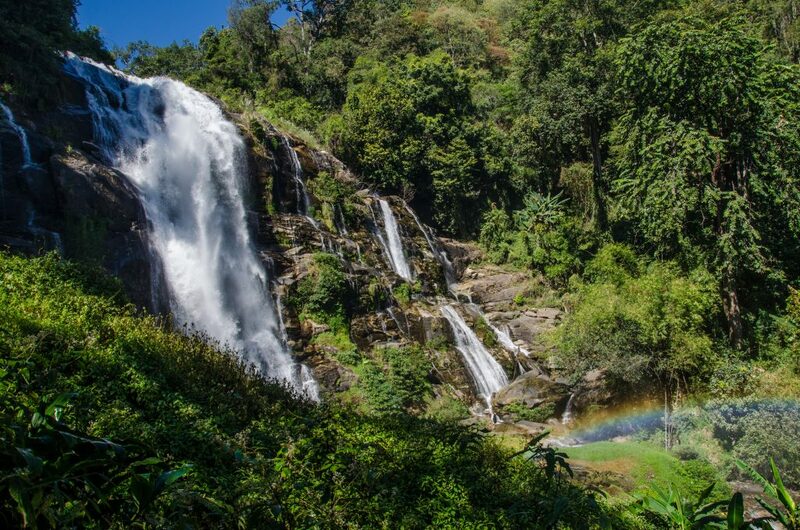 From there you can proceed to the Doi Inthanon entrance gate, follow the road and stop at the other two waterfalls. 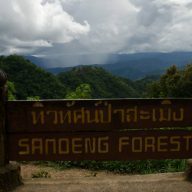 Trekking in Doi Inthanon: Kiu Mae Pan – starts at km 42. It takes about 3 hours, or so the guide says, but actually it’s only 2.5 km long, so could take less than that. A permission is need to enter this trek and can be obtained from the park headquarters at km 31. Ang Ka Trail is a little further and you can read more about it above. 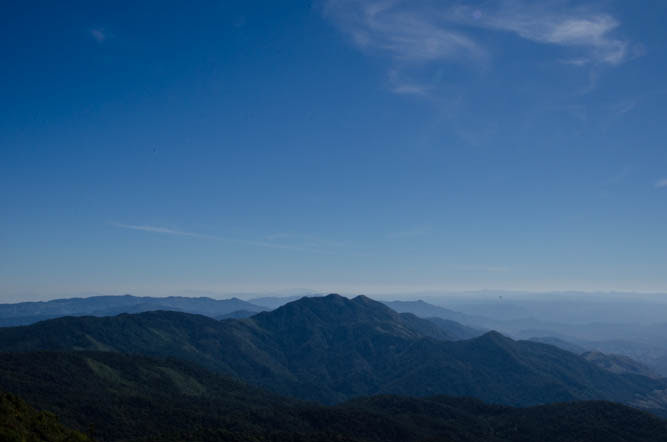 There are more treks in the Doi Inthanon. To get more information (and permission) go to the Park’s office at km 31. Villages and markets: There are 2 markets at km 31 – when you drive up the first one will be on your right. Don’t stop there as it’s a tourist trap. The second one is just after that, on the other side. It is also a little touristy, but the busses from the organised tours stop at the first one most of the time. There are also a few villages and towns around and if you have time I would recommend to visit them. I have only been to Mon Chaem and it was really great. There are also a lot of villages around, which are worth visiting. To get there take the route number 1192. Stupas: You cannot miss the Phra Mahathat Napha Methanidon and Phra Mahathat Naphaphon Bhumisiri, located at km 41.5. 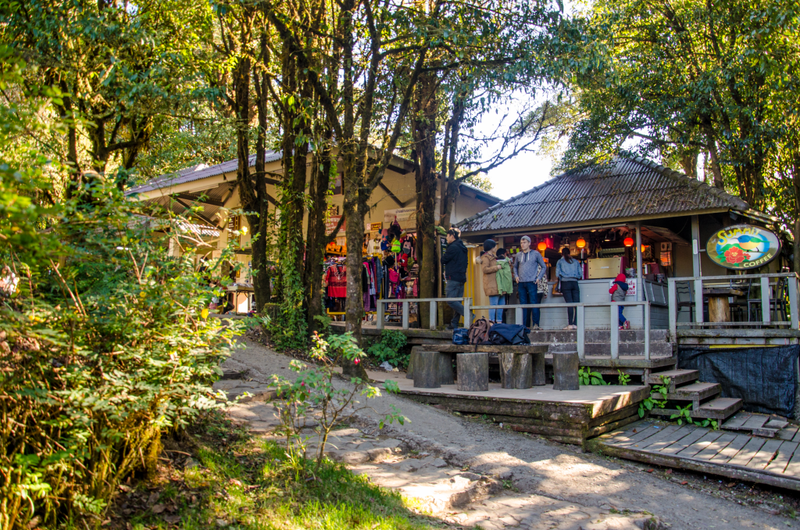 This is one of the places to see when you visit Doi Inthanon.